Qwillia Rain: And Here's the New Me! 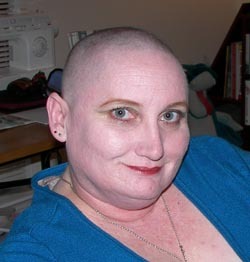 So, this is what I look like without hair. LOL Post-St. Baldricks Day. And yes, that is a stuffed dragon and a sewing machine behind me. I am a Renaissance Woman, I have many talents. And here's another picture...this one is of the tattoo I have on the back of my neck and head. Now you can see it since my hair isn't in the way. Congratulations on being a survivor Tara. It was really no sacrifice to me as long as I was able to get donations for the kids. You are indeed a woman of many talents. I have a pre-teen niece who donates her hair and I couldn't admire you ladies more! I also shaved my head one year ago this month in fact, though I must confess not for such a noble cause as you. I'm sure someone is going to be very happy to receive a beautiful head of hair. Thank you Paris and Rie, I love the way it feels to have no hair. I'm hoping the hair I saved will be suitable for donation, since it was color-treated, I don't think some places will take it. I'm hoping when my hair grows back in, it'll be a little curlier. LOL. I think you look awesome bald and the tattoo is fabulous! Thank you Kissa, I loved being able to help out, and I'm up to $600 in donations!! I'm very happy. What an awesome, selfish, generous thing to do. I'm in awe of women who do that. And I agree with Kissa. You look fabulous! Thank you Delaney. I like the new look. Ironically, I had another lady I know comment to me that she thought I was brave not to be defined by my hair, since so many women usually are. Kinda makes me wonder what we're saying to our kids and the world when the outside seems more important than what's inside. Hmm. Sorry, shouldn't wax philosophical before my first Dr. Pepper of the day. LOL. Hey Qwillia, I hope you get your wish and your hair comes back in curly. I use Bedhead blue goop in a tiny very expensive jar, but if I crinkle my hair while I mash it in, it looks like I have curls and not just waves. My 3rd son donated to Locks of Love after not cutting his hair for about 5 years. They got 2 chunks of 10-11 inches each, and he had untreated very curly hair. It was gorgeous! He donated a second time, and since we only got 8 inches that time, I sent it to Pantenes charity thingie. Makes sense, since he always uses their products to keep it gorgeous! And I really like your dragon. 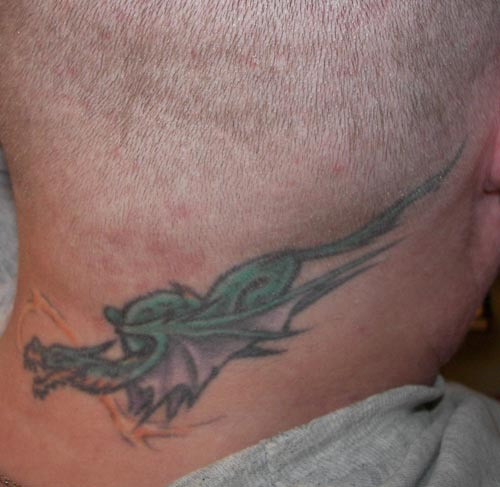 Were you born in the year of the dragon? My oldest son was, and I've told him that if I was born in anything other than the boring year of the monkey, I'd probably have my animal on me somewhere...I have lots of other tats. I wasn't born in the year of the dragon, it was the year of the Fire Horse.